As a precursor, we’re going to be talking about some extremely precise measurements. I mentioned thousandths of an inch. So, how big is a thousandth of an inch exactly? It’s small. 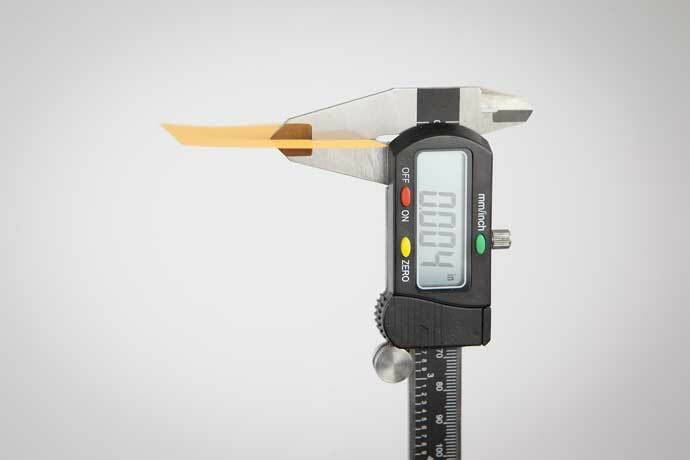 In fact, it is so small that when using our digital calipers, we’re at 4 thousandths (that’s .004” or 4 “thou”) when measuring the thickness of a Post-it note. Why does this matter? Well, we’ve done some testing, and we’re confident in saying that if your skate edges aren’t even, say one edge is 4 “thou” or a Post-it Note higher than the other, you’re going to notice it. Not only are you going to notice it, but you’re going to feel like you’re missing an edge on one side and have a razor blade on the other. Not the greatest feeling when you’re out on the ice trying to perform at your highest level. If you’re not feeling confident in your skates, your play will be negatively affected. During our testing, we took over 30 pairs of skate steel and purposely altered their edge height. To help keep this test blind and the results unbiased, every test subject sharpened another test subject’s skate steel. To double check each blade’s desired edge height, we used a couple of handy tools; the HDI (Hollow Depth Indicator, Edge Specialities, Inc.), which is the most accurate way to find exact edge height and the more traditional hockey blade edge checker that you may have seen at your local shop. We sharpened every blade using our own Sparx Skate Sharpener. Sparx allows us to easily produce perfectly even edges for some blades and to precisely control the amount of edge height offset on the uneven edges that we also produced. We then took to the ice with four test subjects, all hockey players (1 Gold Medal winner, 2 NCAA College players and one professional skate sharpener), to do our blind testing. The goal was to develop an understanding of the point at which most skaters will feel the effect of uneven edges. Remember that Post-It note? Well, as stated earlier, it turns out that if your edges are off by even that tiny amount, chances are you’re going to struggle on the ice. In fact, it could be downright dangerous in the right situation. 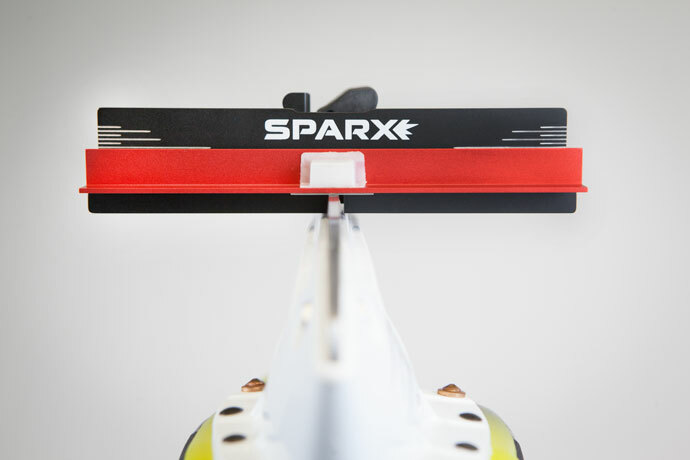 When we’re out demoing the Sparx sharpener, we often see skates that are uneven by more than .004” (or 4 thou). It’s not uncommon to see .005” or even .006” edge height difference. While we find it shocking to see, we know that most players and parents aren’t carrying around an edge checker, so we understand how it can go undetected when a player or parent gets their skates sharpened. 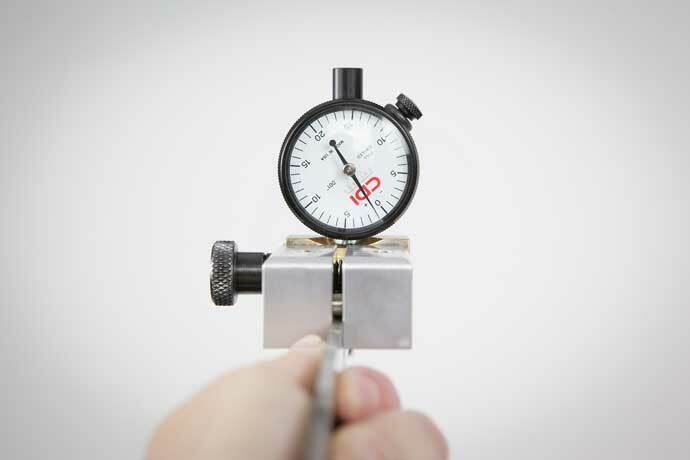 Four thousandths of an inch is a tiny, tiny measurement. When thinking about it this way, it is not hard to see how an inexperienced sharpener could be off by that amount. Fortunately, we can quickly and easily fix that problem for them. Of course, there is more to a great skate sharpening than just even edges. You’ll want to be looking for a smooth surface finish as well. These two things, even edges, and a smooth finish are the tell-tale signs of a great sharpening produced by either a high-performance machine like the Sparx Sharpener or a seasoned and trusted veteran skate sharpener. Have you tested edge height before? Or, perhaps you’ve had the unpleasant experience of unknowingly testing a poor sharpening? Share your thoughts and questions in the comments section below. We’d love to hear from you.